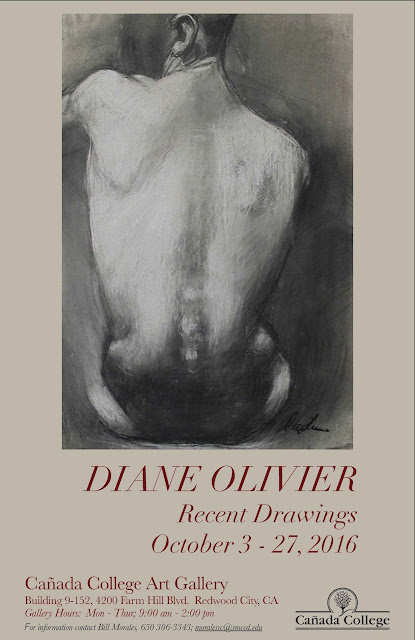 The Cañada College Art Department is pleased to present an exhibition of drawings by Diane Olivier in the Cañada College Art Gallery. This art show runs from October 3 through October 27. The Gallery is located in Building 9, Room 152. The Gallery is open Monday and Wednesday, 8:30 a.m. – 2 p.m., and on Tuesdays and Wednesdays from 9 a.m. – 2 p.m.
Diane Olivier is a Bay Area Artist known for her paintings of the landscape, and her drawings of the figure. This present exhibition consists of eight drawings done from the model. She works in a variety of media but with an emphasis on pastel. There is a boldness to her drawing, combined with the realism of the depiction that creates a strength and directness to the work. There is also a very strong design of shape and spaces in each piece. Olivier has been teaching drawing at City College of San Francisco since 1991. She also teaches Travel/Drawing workshops abroad. More of her work can be viewed online on her website, dianeoliver.com. For more information on this show you may contact Bill Morales, at moralesw@smccd.edu, or 650 306-3343.